Businesses of nearly any size and in nearly every industry are looking to automation to help improve competitiveness and employee safety. Manufacturing processes were early targets for automation, and advances in cost-effective, safe, and easy-todeploy collaborative robots quickly made this type of automation accessible even for small and mid-sized businesses (SMBs). After seeing fast and substantial return on investment from these technologies, business leaders are now looking to automate other wasteful processes within their organizations. A prime target is material transportation. In manufacturing, even highly automated plants still use skilled workers to manually push carts to deliver parts and systems from one process to the next. In other industries, such as hospitality and healthcare, workers spend valuable time moving trash, linens, laundry, or food rather than catering to guests, patients, or residents. In the past, automated guided vehicles (AGVs) were the only option for automating internal transportation, but these required expensive, fixed installations, typically using permanent tracks or sensors embedded in the floors of large factories. Today’s autonomous mobile robots (AMRs) provide extraordinary flexibility, cost-effectiveness, and safety, and are transforming material transportation in the same way that collaborative robot arms transformed manufacturing. But all AMRs are not the same. Business owners need to understand the technologies behind these productivity tools in order to make the best decisions for their specific needs. AMRs from Mobile Industrial Robots (MiR) integrate a critical set of technologies that set these robots apart from competitors and offer substantial advantages to business owners in several key areas, including ease-of-use, flexibility, safety, and return on investment (ROI). One of the biggest advantages of AMRs is how quickly, easily, and inexpensively they can be set up, programmed, and used. With the MiR robot, new customers can drive the robot out of its box using a Wi-Fi-connected smartphone, tablet, or computer and have it running basic routes in less than an hour. Mapping the facility for the robot is as simple as downloading a CAD file or by manually “driving” the AMR through the building using the robot’s web-based software to build a map. The MiR robot’s intuitive user interface allows employees to set up the robot and create mission routes without any programming experience. They can easily create off-limits areas for the robot, send the robot up or down ramps, and program the robot to activate interior doors and elevators. This ease-of-use is the basis for the MiR robot’s flexibility. The robot’s missions can be easily updated and the map can be changed to match changes in production layout— usually within minutes. The user interface can be customized for individual profiles to specify each user’s level of access and control. The robot also has a full-featured REST API that allows technical users to take advantage of standard protocols to integrate the robot with existing ERP systems. That allows the robot to work within a fully automated production environment in which the ERP system summons the robot when it is needed. When used with multiple robots and the MiRFleet software, up to 100 robots can be managed and prioritized for jobs based on location and availability. Additional flexibility comes with MiR’s open-source approach to implementation, which allows businesses to customize the robot’s top modules for nearly any use. 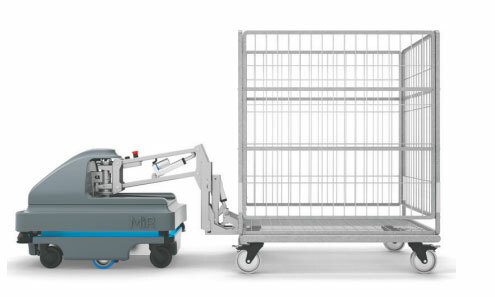 All MiR robots are designed as mobile platforms with standard mounting holes. Common top modules such as shelving or storage bins can be easily built and mounted in-house. 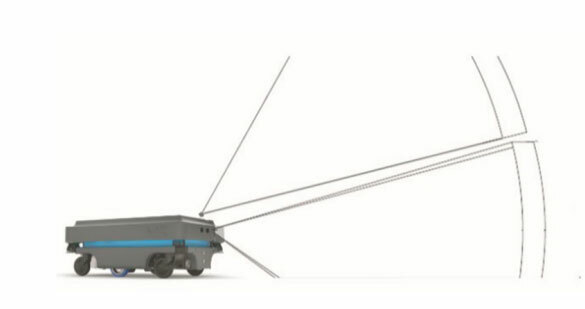 Other options for top modules can include conveyors, collaborative robot arms, lifts, or the one-of-its-kind MiRHook that automates the retrieval and towing of carts for heavier payloads. Customers can choose the right robot for each budget and payload requirement, from the MiR100 that can carry 100 kg/220 pounds and tow up to 300 kg/660 pounds, to the MiR200 that can carry 200 kg/440 pounds and tow up to 500 kg/1100 pounds. The robots are designed for nearly any work environment. With ESD and clean room certification (for the MiR200 robot), they are also ideal for specialty production environments such as electronics, food and beverage, or medical devices. For business owners, this ease-of-use and flexibility is a critical aspect of ROI. The robots require little to no outside assistance to deploy, program, and redeploy as business needs change. Customers take full ownership of the robot and can easily test new pilot programs, change top modules and missions, and adapt routes to get the highest possible return on their initial investment. In most cases, the payback period for MiR robots is typically less than a year. Kamstrup, a leading manufacturer of intelligent power meters, has experienced significant growth with the global focus on energy efficiency and sustainability. 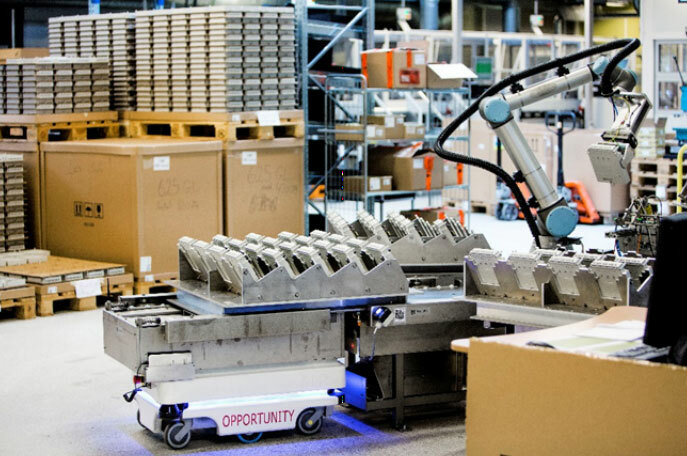 Kamstrup has integrated MiR robots into its ERP system to ensure maximum utilization of production capacity. The robots are mounted with conveyor belts that can automatically deliver and receive items at each manufacturing cell, and run non-stop 24 hours per day, five days a week. The flexibility of the robots allows Kamstrup to quickly adapt its high-mix, highvolume production and releases employees for important tasks such as developing and producing new prototypes. A key difference between AMRs and AGVs is their ability to navigate safely around people and obstacles. 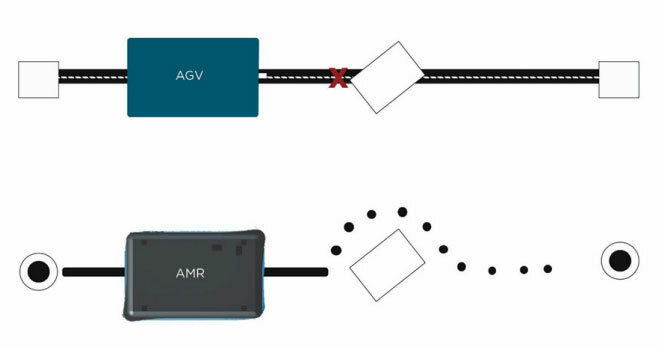 AGVs must follow a fixed “track” (such as magnetic strips or wires embedded in the floor) and can’t deviate from that route. If people or objects block the track, the AGV must stop and wait for them to move before it can continue. AMRs, however, use sensors and software to respond in much the same way that a car’s navigation system responds to detours. Because the robot is initially programmed with a map of the facility, it can easily back up or change routes to bypass obstacles and efficiently complete its mission. The MiR robot includes two ISO 13849-certified laser scanners that meet the Category Three, Performance Level D safety standard. The two lasers are placed on the front and back corners of the robot to provide a 360-degree field of vision. This dual-laser approach allows the robot to be able to safely back up if it encounters an obstacle that it can’t maneuver around, or to detect people approaching from behind or from the side and adjust its course as needed. 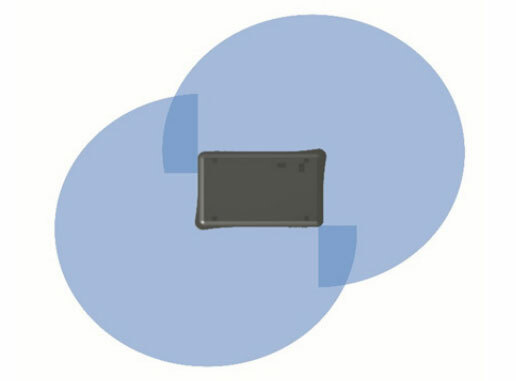 The protective zones of the robot are dependent of the robot’s speed. This allows the robot to safely and slowly drive very close to obstacles, and it will automatically stop if a person or obstacle comes within a few centimeters. But the laser scanners are only a part of the MiR robot’s comprehensive safety and navigation systems. Additional navigation aid is provided by a 3D camera mounted on the front of the robot to detect obstacles up to 2 meters ahead and from 5 centimeters to 80 centimeters from the floor. A top camera can also be added to the robot to detect obstacles up to 1.8 meters high. This allows the robot to safely maneuver around tables, for instance, which are above the laser scanner’s field of vision but shorter than the height of the robot’s top module, such as a tall shelving unit or robot arm. Other obstacles such as wall-mounted cabinets, shelves, or water fountains can also be avoided. 3D camera provides additional safety capabilities by detecting obstacles up to 1.8 m high. The complete multi-sensor safety system tehnology integrated into MiR robots also offers noticeably smoother navigation than other AMRs, which allows the robot to complete its missions more quickly and dependably because it doesn’t need to stop and re-route when obstacles occur. Additional sensors include accelerometer and gyroscope to sense inertial force, acceleration, and rotation; and encoders on each wheel to measure speed for accurate feedback to the laser scanners. The safety laser scanners, 3D camera, and additional relays and PLCs feed data into a sophisticated planning algorithm that decides if the robot should adjust its course or make a safe and immediate stop to avoid a collision. The robot can also be easily programmed to optimize navigation and safety. On the robots’ map, forbidden zones can be marked simply by using the touchscreen of a smartphone or table. Other instructions, such as defining preferred paths or restricting the robot’s speed in highly trafficked areas are as easily programmed. While workers are typically most comfortable when the robot doesn’t exceed their walking speed, the robot can safely drive up to 5.4 km/minute if needed, which can be advantageous for long distances between stopping points. The robot includes a distinctive light bar on all sides that provides color cues to communicate its status to workers, and sound cues—including beeps, horns, or any desired MP3 or WAV file—can also be easily programmed. 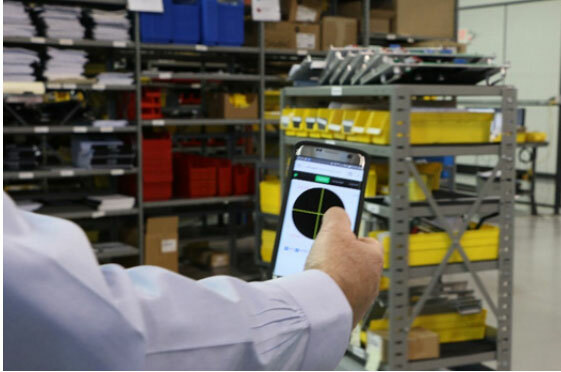 Honeywell Analytics produces gas-detection equipment in a 91,000-square-meter facility with the warehouse and manufacturing on different floors. MiR robots were the only mobile robots available that could autonomously control elevators, as well as safely maneuver through narrow hallways and double fire doors. 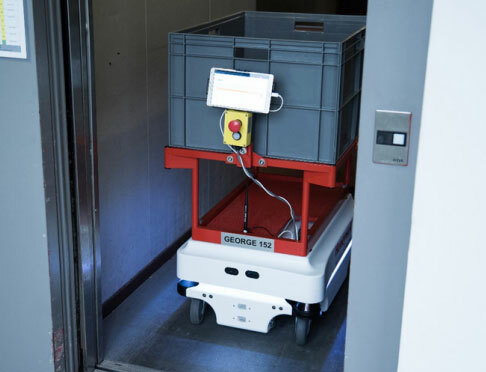 Options within the software allow the robots to use a Bluetooth interface to autonomously open fire doors, and interface with a PLC to control elevators. The robots have freed the equivalent of six full-time employees for higher-value tasks, and the company has plans to automate even more with AMRs. Some business decisions can be made without a deep understanding of the technology behind the tools, especially if those tools must be integrated and managed by specialized personnel. But today’s robotics are characterized by ease-of-use, safety, and flexibility that allow the business to take complete ownership—and get the benefit of fast ROI. Business owners need to understand the technologies in order to make effective comparisons and implement the best approaches for their specific needs. MiR - Mobile Industrial Robots Inc. Mobile Industrial Robots is a leading manufacturer of collaborative mobile robots. We are dedicated to developing user-friendly, flexible and safe robots to help companies increase the efficiency of their operations. Booth #7368 - We will showcase our new fleet management system, entire fleet of autonomous mobile robots, including the MiR100, MiR200 and the MiR500, the newest robot that is designed to automate the transportation of pallets and heavy loads across industries. “The robot saves at least five hours in transport time a week, and the working day is quieter and calmer,” Broberg said. “I already take 15,000 to 17,000 steps a day in my job, so I definitely don’t miss the walk to the pallet stacker." Using the robots built-in Wi-Fi interface, operators will use tablets installed at each press to call the robot to pick up finished products and take them directly to the quality department, optimizing the robots use. More about MiR - Mobile Industrial Robots Inc.